LEARN ABOUT OUR NEW MR SCANNER! 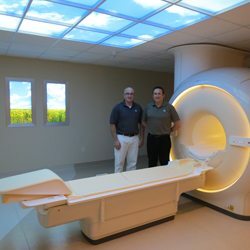 Detailed MR images allow physicians to better evaluate various parts of the body and determine the presence of certain diseases that may not be assessed adequately with other imaging methods such as x-ray, ultrasound or computed tomography (also called CT, or CAT scanning). Currently, MRI is the most sensitive imaging test of the neurological disorders related to the head and spine (particularly in the brain) as well as injury and disease related to the joints such as knee and shoulder. Injuries to the spine such as herniated and bulging discs as well as degenerative disease. It is normal for the area of your body being imaged to feel slightly warm, but if it bothers you, notify the radiologist or technologist. It is important that you remain perfectly still while the images are being recorded, which is typically only a few seconds to a few minutes at a time. You will know when images are being recorded because you will hear tapping or thumping sounds when the coils that generate the radiofrequency pulses are activated. You will be able to relax between imaging sequences, but will be asked to maintain your position without movement as much as possible. You will usually be alone in the exam room during the MRI procedure. However, the technologist will be able to see, hear and speak with you at all times using a two-way intercom. We allow a friend or parent to stay in the room as long as they are also screened for safety in the magnetic environment. Our technologist will offer earplugs to reduce the noise of the MRI scanner, which produces loud thumping and humming noises during imaging. Children will be given appropriately sized earplugs or headphones during the exam. MRI scanners are air-conditioned and well-lit. You should tell the technologist if you have medical or electronic devices in your body, because they may interfere with the exam or potentially pose a risk, depending on their nature and the strength of the MRI magnet. In general, metal objects used in orthopedic surgery pose no risk during MRI. However, a recently placed artificial joint may require the use of another imaging procedure. You should notify the technologist or radiologist of any shrapnel, bullets, or other pieces of metal which may be present in your body due to accidents. Dyes used in tattoos may contain iron and could heat up during MRI, but this is rarely a problem. Tooth fillings and braces usually are not affected by the magnetic field but they may distort images of the facial area or brain, so the radiologist should be aware of them. Those who accompany patients into the scanning room also need to remove metal objects and notify the technologist of any medical or electronic devices they may have.